The Les Ranchisses Campsite benefits from a stunning location, within walking distance of the attractive town of Largentière. With a nearby lagoon providing opportunities for swimming or even a turn in a canoe, there is no shortage of entertainment available in the local area. The luxury camping site creates the perfect location in which to spend your holiday. You can book immediately with LUX-camp. Why should I camp at Les Ranchisses Campsite? 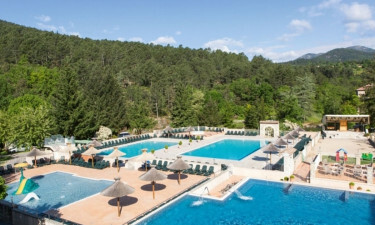 For those seeking a luxury camping experience, Les Ranchisses Campsite manages to combine the comfort of mobile home accommodation with the flexible options for outdoor dining and entertainment that can help to transform a holiday. With facilities suited to families, this is a popular site that makes the most of its impressive location. 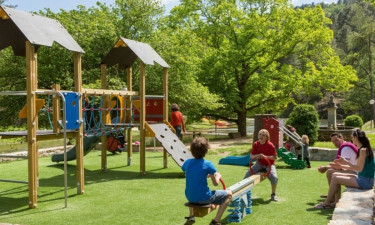 Guests are able to make the most of a range of sporting facilities, together with a pool complex that keeps children of all ages entertained during their stay. The exclusive Wellness Centre enables guests to enjoy spa treatments and to make the most of a relaxing stay at this luxury camping site. Guests are able to enjoy a wide variety of entertainment, with a mixture of exercise classes, quizzes and sports tournaments. Children's disco evenings are also held with regularity during peak season, ensuring that all members of the family have something that they can enjoy. There is a separate TV room, which is particularly popular when major sporting events are being televised. The swimming pool complex comprises 3 outdoor pools, including one that is suited to use by younger children. All pools are heated and there is added entertainment provided by a mixture of slides and fountains. The Wellness Centre boasts an indoor swimming pool, which is suited to those aged 16 years and over. With a Jacuzzi bath and sauna, this is the perfect space in which to relax. A range of spa and relaxation options are available, including massages, facial treatments, pedicures and nail treatments. The facilities are extensive, allowing guests to take advantage of a dedicated steam room, hydrotherapy bath, jet shower and ice fountain. 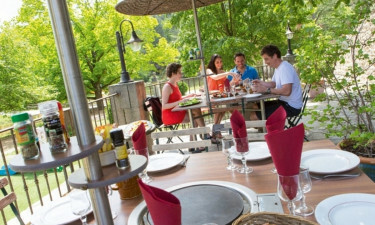 The Les Ranchisses Campsite offers an excellent range of options for those who enjoy dining out. There are two restaurants, each boasting outdoor terraces. Menus change regularly, with a focus on fresh, local produce. There is a separate pizzeria, together with a takeaway restaurant that caters for those preferring a night in. Guest are able to enjoy meals within the comfort of a luxury mobile home or bungalow tent on the site. A bar offers entertainment into the night, providing a relaxed environment in which to meet other guests during your camping holiday. The holiday camping site has a grocery store selling all of the basics, including food, drink and toiletries, in addition to a fine selection of regional wines and freshly baked breads and pastries. The site has a library and board games can also be hired, should you have forgotten to bring any with you.